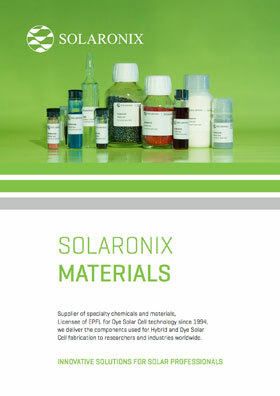 Solaronix has a selection of polymer films specifically adapted to sealing electrodes. These materials demonstrate excellent chemical compatibility with the other components of Perovskite and Dye Solar Cells. The gaskets easily cut from these films will ensure a perfect confinement of the inner materials of the devices after hot press lamination. We have been using Meltonix for over 15 years, proving its stability and durability. Thicknesses of either 25 or 60 µm are available, and gaskets may be stacked for increased sealing thicknesses. The sealing process consists in melting the gasket onto the electrodes at controlled pressure and temperature with the help of a hot press or a vacuum laminator. The adhesion of Meltonix on glass substrates is excellent, leading to a fully transparent sealing. Solaronix provides a film cutting service to obtain custom shapes of Meltonix films. Feel free to inquire with your desired dimensions. Meltonix films can be supplied on a liner for whose who may apply a 2 step lamination process, or as a carrier sheet for cut works. Seek for the PF suffix of the same product names at ordering (ex: Meltonix 1170-25PF). Use Amosil 4, our dispersed two component sealing system for a supplementary sealing of your devices in conjunction with the Meltonix products.